I want tu to answer this pregunta truthfully. Do tu think Nobodies have hearts? I think they do, because of, Axel, Xoin, and Roxas. They keep mostrando that they do indeed have hearts. They always express feelings, and they constantly have to remind each other that they don't have hearts, which I don't think is true. I think it's in their heads. They do have hearts. 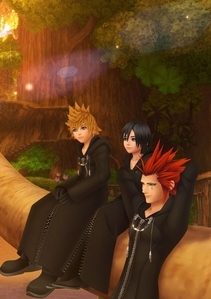 Roxas was scared to think that he could possibly lose his friends. But if tu disagree with my statments, tell me what tu think. I agree that those three had Hearts, and Namine also. I believe they DID but they lost them in some way. Xion never had a corazón but she had true emotion and felt what it was to have a heart. Axel IDK maybe he has a corazón he can feel real emotion so maybe. It will be revealed in KH Dream Drop Distance. Roxas has Ventus' corazón which not only allows him to feel real emotions but duel wield hell ya! Nobodies as a rule, don't have hearts. Dusks, Creepers, Luxord, Zexion etc. don't have hearts. Roxas - Being Sora's Heartless, he carries Ventus' corazón within him when he is created giving him feelings and emotions. Axel - Axel connects with the Roxas and is able to feel emotions and so forth via Ventus' corazón within Roxas. He has no corazón of his own. Naminé - It's doubtless she even is a Nobody, DiZ simply states it's the easiest thing to call her. Born of Kairi's corazón of pure light, but encased in Sora's body which held darkness, she took a form similar to Kairi and thus belongs with her. She has no heart, but may not be a Nobody in the first place. She has no heart. Xemnas - Xemnas carries a few hearts within him, possibly. When Master Xehanort became his two halves, he had his own corazón within him, Terra's and Master Eraqus'. At least one of those resided within Xemnas' body. Xion - Isn't a Nobody. She's a Replica of one. Much like Roxas feels because of Ventus' heart, these feelings are replicated within Xion. She has no heart. I don't know if tu made this before o after DDD but this is incorrect. Okay, so I publicado this on Roxas fanclub, and I believe I should post it here, too. Long explanation, but I believe it'll clear up alot for everyone: It has been revealed as of Kingdom Hearts: Dream Drop Distance, that Nobodies have the ability to grow their own corazón over time, through experiencing situations that would otherwise trigger feelings. The only officially confirmed Nobodies to have their own hearts are: Namine, Axel, and Roxas. In retrospect, it seems apparent though that all members of the Organization developed a heart, even Xemnas (a bad corazón is still a heart). The reason that no one knew was because Xehanort intentionally lied to the nobodies of Organization XIII for his own gain -- if they believed they didn't have a heart, they'd do whatever it took to get one (Xigbar knew, however). I believe that even Yen Sid didn't know that this was possible, as I think he told Sora that Nobodies had no heart, further cementing to the audience that "Nobodies don't have feelings". But obviously, we all know something had to be wrong with that. Since the beginning, quite a few fans predicted that it would be a lie -- and they were all entirely correct. From the loveable feelings -- Xigbar's sense of humor, Demyx's musical affinity and preference for lazing around, Roxas's adorable preference to ice cream -- to the distateful habits -- Larxene's enjoyment at other's pain, Marluxia's interest in himself and his superiority, Saix's anger and bitterness. From the first time we saw them to the last, all these feelings were geniune from hearts -- their OWN hearts. If tu really consider it, technically, aren't they somebodies now? What tu need to become a somebody is to have a body and a heart. Nobodies are empty bodies already, and if they gained a heart, haven't they completed all the requirements? The only thing is, technically it's a borrowed body (from their sombodies), instead of their own.